Art has long played a role in representing aspects of medicine. 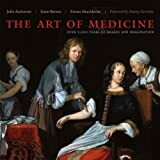 The Art of Medicine is a coffee-table book which presents highlights from one of the world's great holdings of medical art, from the Wellcome Collection, a museum founded in 2007 in London. This museum is part of the Wellcome Trust, originally founded by Sir Henry Solomon Wellcome in 1936, now one of the world's largest non-governmental providers of funds for biomedical research. Sir Henry (1853-1936) collected a massive number of artworks, including books, sculptures, prints, and paintings, and the Wellcome Collection has added more recent works of art to the collection in recent years. This book presents selections from the collection. If I refer to a particular work and you wish to view it, just put the artist's name or the work's title in the search bar. One of the most striking features of this book is its display of the collection's breadth. As one would expect with such a collection, classic prints representing the development and tribulations of modern western medicine are included. For example, a famous print from Goya is displayed ('Of What Illness Will He Die? ', c. 1797) as is one of Vesalius ('Skeleton, Side View', 1543). But so are many pieces representing the long and diverse history of medicine. Here are a few examples: an image of 'Chinese Acupuncture Charts' (18th century); images derived from medieval herbal textbooks, such as 'Angelica' (from 'Herbal extracted from Dodoneaus'); a 17th century Tibetan bloodletting chart ('Bloodletting Points and Moxa Points on the Human Body'), and a painting of an Indian Ayurvedic physician ('Man of the Medical Caste', c. 1825). The artworks are presented in chapters unified around particular themes. Chapter One, for example, is titled 'Mapping the Body', and Chapter 5 is titled "The Mind and Mental Illness". Some of the art is straightforwardly 'medical', in that it was produced and disseminated with the intention of teaching physicians or trainees about particular aspects of the body and its diseases and treatments (I use the term 'physician' here in a culturally broad sense--any person recognized as a healer in that person's society--since much of the art presented in this book comes from cultures whose healers employed practices and held theories quite different from modern western physicians). For example, écorché anatomical drawings, such as Mascagni's 'Stratum Primum' (1823), are themselves brilliant artworks but when first produced were principally textbook images. Some of the art is not straightforwardly medical, but was rather intended as critical scrutiny of some aspect of medicine. Indeed, many artworks displayed in these pages represent medical nihilism. The interest of physicians in selling their services despite the health of their patients is portrayed in Temple West's 'An Address of Thanks from the Faculty to the Right Hon-ble, Mr Influenzy for his Kind Visit to this Country' (1803)--the physicians have padded their fees thanks to the spread of the virus. I have already mentioned Goya's 'Of What Illness Will He Die?' (c. 1797), in which a prominent physician is portrayed as a donkey. Numerous examples of medical ineptitude is portrayed in Utagawa Kuniyoshi's 'A Japanese Medico-Political Caricature' (c. 1850). The British artist William Hogarth (1696-1764) depicted physicians as quacks, one such painting here is titled simply 'Damn the Doctor' (18th century). A woodcut from 1537 titled 'Gout with Pluto, Jupiter, and Neptune' includes a figure holding a banner which reads "medicine cannot cure knotty gout." A skeleton is seen mixing a 'slow poison' in a painting by Thomas Rowlandson (1756-1827) titled 'The English Dance of Death: the Apothecary' (1816). Rowlandson also satirizes surgery in a gruesome painting titled 'Amputation' (1793). In case it is not already obvious, there are many artworks presented here which, to a modern eye, represent a scene or subject not merely curious but bizarre. For example, a 19thCentury Chinese depicts several patients, described in the title of the painting: "Men afflicted gonorrhea and a physician with a woman whose lower body is in the form of a snake." There she is, half woman, half snake. Making an old metaphor fresh, a lithograph by Fritz Kahn portrays the human body as an industrial factory ('Man as a Palace of Industry', 1930). Early modern anatomy books often included a piece titled 'wound man', which portrayed a figure who has been injured in many ways common at the time: stabbed by a sword, shot with an arrow, bit by a spider, and burned; three such images are presented here. Other gems in the collection include 'A Surgical Operation' (c. 1934) by Reginald Brill, in which the surgical team is portrayed in heroic stature, clean, strong, and focused. In contrast to the all-male surgical team of Brill's painting, Francis Dodd portrays a remarkable all-woman surgical team operating in London during the first world war ('An Operation for Appendicitis, at the Military Hospital, Endell Street, London', 1917). A brilliant and evocative painting is Luciano Nezzo's 'A Surgeon Holding a Dental Key Behind his Back to Conceal It From The Patient' (c. 1900). The bleak, sorrowful etching titled 'James Norris' (1814), by George Arnald, helped publicize the terrible treatment of incarcerated people with mental health problems at Bethlam hospital. Recent works are also represented here. Beautiful examples include Ludovic Collin's 'Neurons in Culture' (2005), which employed fluorescence microscopy; Luke Jerram's 'H1N1 Swine Flu Virus' (2009), which is one of a series of colorless glass sculptures representing viruses, and Anna Tanczos's 'Common Cold Virus' (2008), produced digitally. This is an impressive collection of art related in many ways to medicine. The captions and introductions to the sections of the book--written Julie Anderson, Emm Barnes, and Emma Shackleton--provide ample context to appreciate the works. The art displayed in this book makes me want to see the museum. I recommend the website in which one can view most of the images mentioned here, and I recommend the book.